Pink-slipped and hungry: where to go for your last lunch? I am one of those unfortunate souls facing a layoff in a few weeks and suddenly feeling like I have to make sure I have one last lunch at my favorite haunts downtown. 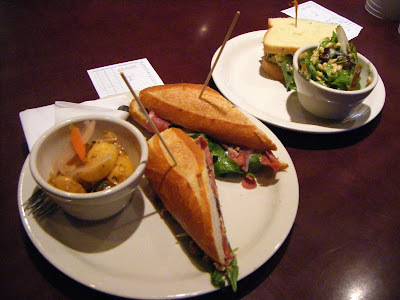 On the list are JR Sprints Cafe (turkey sandwich) Wild Ginger and Salumi. What else should I hit before the paychecks stop flowing in? I thought I’d throw the question out to my Eatership, so help me here, please: Where would you go for your last lunch(es) if the bad news came your way? 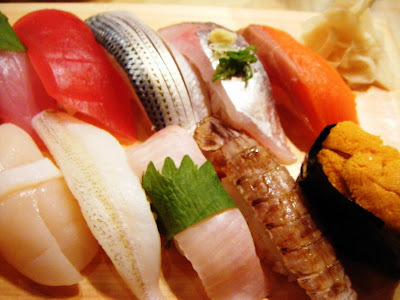 And you already know I’d make an immediate beeline for Saito’s for sushi, where I’d let Yutaka-san set me up with whatever he deems worthy. 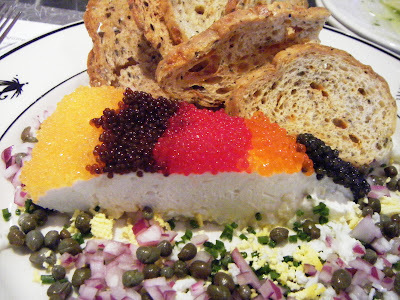 I’d also take a counter seat at the Steelhead Diner to drown my sorrows with a slice of caviar pie. 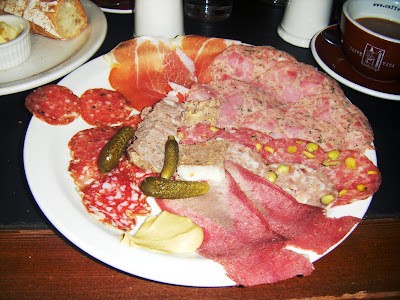 Oh, and of course there’s Le Pichet — for a pichet of rose and a platter of charcuterie. 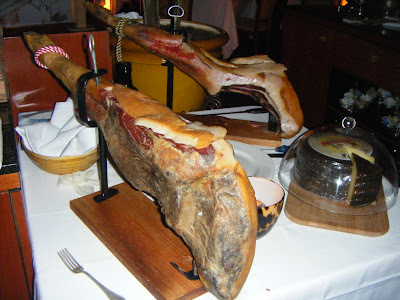 Also: the elegant Spanish restaurant Taberna del Alabardero — the one that moved in after Cascadia moved out. They’re famous for their paella, but I’d be sure to have a taste of Iberico ham. Rich! But a little goes a long way. 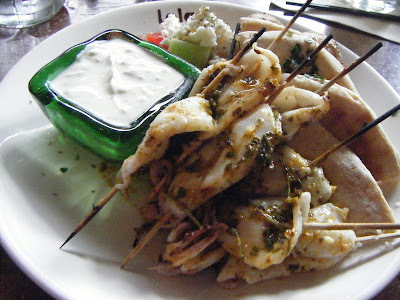 Then there’s Lola, where I’d order the spicy chermoula squid with a Greek salad, a side of smashed potatoes and extra pita bread. Afterward, I’d go across the street to the Dahlia Bakery for a bag of that housemade pita and a mini-triple-coconut-cream pie. 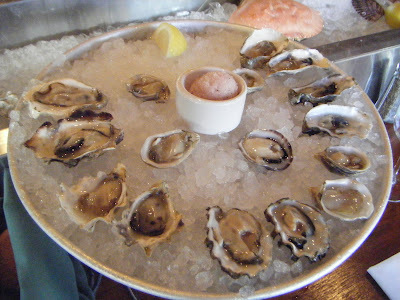 I’d probably have to have one last slurp-o-rama at an oyster bar. 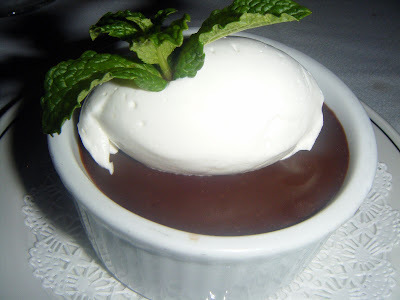 Elliott’s Oyster House tops my list of great options. Yo, Mr. Elliott’s oyster-shucker: Do you have any shigokus? I’m most definitely with Pink-slip regarding Salumi (and sadly, with their truncated hours and my overly-full ones, I don’t get there often enough). But I’d also have lunch at Tamara Murphy’s revamped Elliott Bay Cafe and opt for a sandwich with one of their fabulous sides. Afterward, I’d head upstairs to the Elliott Bay Book Company and treat myself to a great cookbook. Hey, Pink: I have a lot of cookbook favorites, but If you don’t already have it, may I suggest Lynne Rossetto Kasper’s “The Splendid Table’s How to Eat Supper”? It’s a great read, and will help you embrace the joys of home-cooking anew. Those are only some of the places I’d go. You? And though I was answering the question re: downtown Seattle, feel free to chime in about the lunch-spots near your workplace, where ever that may be.